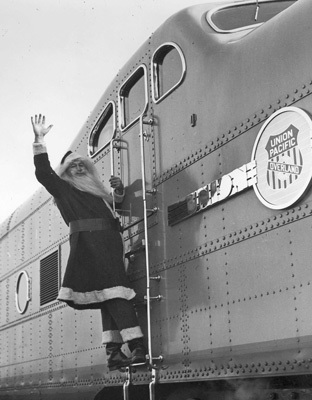 Of the many time-honored holiday rituals the arrival of Santa Claus is among the most indispensable. The traditional Santa’s visit is on the night before Christmas. But modern merchandizing has continually pushed back the first appearance of the jolly old elf into autumn. The advent of downtown North Poles and department store toy lands coincided with the age of mass marketing in the 1920s. In the lean years of the Great Depression, when consumer discretionary spending was particularly difficult to stimulate, local merchants were forced to come up with inventive ways to get Santa, and shoppers, to the village stores. In mid-December 1933 the Southern District Business Association in Oak Park out did its rivals by having Santa fly in, not in a reindeer-drawn sleigh, but in a four-passenger monoplane that delivered its portly passenger to the Harrison-Oak Park Avenue shopping area in decidedly modern style. Avoiding rooftops, Santa’s plane apparently landed along the railroad right of way that is now part of the Eisenhower expressway. Along with his pilot and plane, Santa stayed three days dispensing gifts, raffle tickets and taking orders sent directly to his workshop by radio, before taking off, presumably heading back to the North Pole to prepare for his regular Christmas eve visit. Hiding his identity from even his family, Park Superintendent Gus Lindberg, after whom Lindberg Park is named, slipped aboard in Iowa, changed into full Santa regalia and emerged from the gleaming yellow “streamliner” to a cheering crowd of 5,000 local children, parents, ten clowns, and Oak Park Village President James “Jimmy” Howe. Santa/Lindberg then led a procession to the Lake Theater for a special children’s program. Over the years department store Santas charmed Oak Park and River Forest children at The Fair, Wieboldt’s, Marshall Field’s, Gilmore’s and Walker’s. Today those stores are just memories. But Santa still comes to town and hopefully always will.